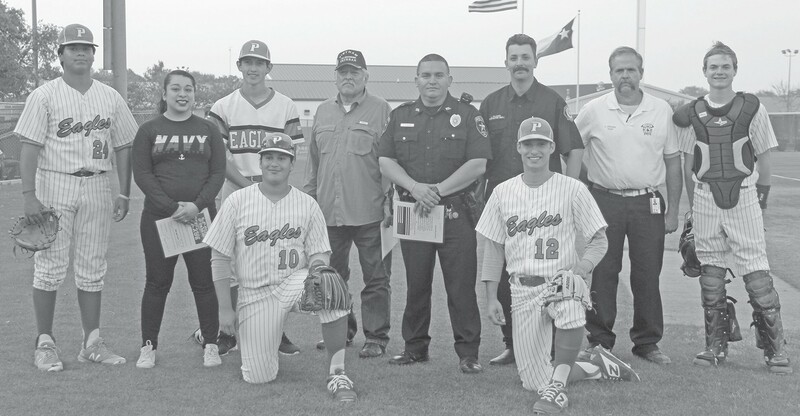 Pleasanton’s baseball team recognized first responders, law enforcement and veterans during its Hero Night ceremony on April 12. 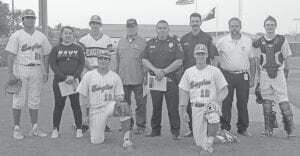 In the front row, (from left) are Niko Escalera and Aaron Perez. In the back row are: Deryian Martinez, Kassandra Alvarez (BM2 Navy, Active Duty), Roman Cuevas Jr., Tony Garcia (Air Force, Retired Veteran), EJ Lozano (Pleasanton PD), Logan Valadez (Pleasanton Firefighter/EMT), Loren Gillespie (Leming/Verdi Volunteer Firefighter) and Auston Gillespie.